The future is now…but it doesn’t look like it was supposed to. Just in time for “Back to the Future Day,” the estate of the controversial automaker John DeLorean has settled a lawsuit over the use of his name. In the second of the three films, hero Marty McFly, played by Michael J. 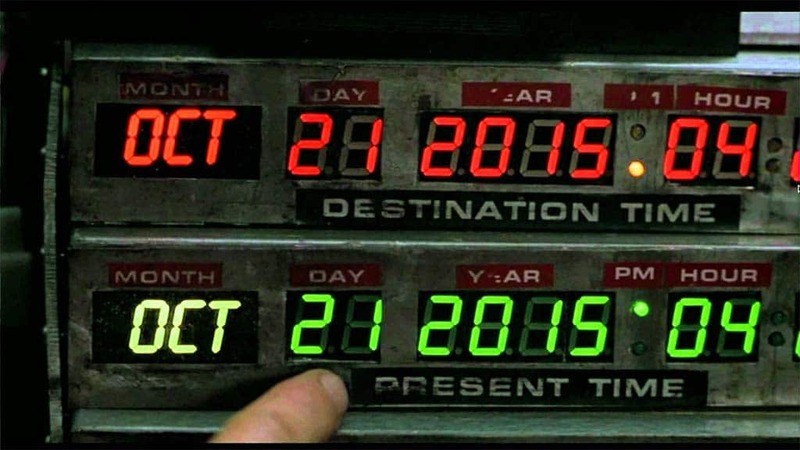 Fox, launches into the future – more precisely October 21, 2015 – where he finds such things as floating hoverboards, home fusion kits and self-drying jackets. The future, it seems, isn’t what it used to be. 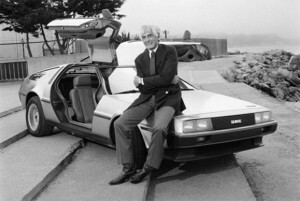 John Z. DeLorean with a DMC-12. But at least the DeLorean estate has reason to celebrate. Widow Sally and her daughter have settled a lawsuit filed against a Texas-based firm that picked up the DeLorean Motor Company name, using it to sell everything from rebuilt DMC sports cars to merchandise bearing the late automaker’s name and image. John Z. DeLorean was an automotive legend in Detroit, a maverick at a time when conformity was highly prized. During his time at General Motors in the 1960s and ‘70s he was credited with helping create some of the era’s most iconic vehicles, such as the “Goat,” the Pontiac GTO. He eventually left the company, detailing its failing in the book, “On a Clear Day You Can See General Motors,” co-authored by Detroit journalist Pat Wright. DeLorean set out to show the world how to do it right, setting up his own sports car company, with the help of British funding, in Northern Ireland. But it was immediately beset by problems that threatened ruin. A desperate DeLorean was busted by the FBI for allegedly trying to sell millions of dollars of cocaine to keep DMC running. Despite video of the sting, his lawyers managed to win an acquittal. But the company was finished, shutting down in 1982 after building only about 9,000 of its distinctive, stainless steel cars. The future is now? 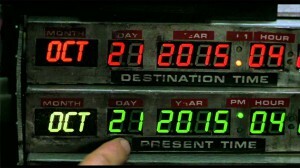 Doc Brown sets his time machine for Oct. 21, 2015 in Back to the Future II. DeLorean continued looking for ways to get back into the car business all the way up to the time of his death, at the age of 80, in 2005. Things took a curious turn in 1985, when one of those DMC-12 sports cars appeared in the first “Back to the Future” flick. It was heavily modified by Doc Brown, a character played by Christopher Lloyd, and capable of traveling through time. In the first film, it is used to go back into the past. It subsequently sets course for 2015. There they discover a high-tech future where, among other things, skateboarding hero McFly gets to use a wheel-less hoverboard. Many of the technologies, notably home fusion, have yet to appear, but then again, the film didn’t envision smartphones or tablet computers. Nor did it imagine DeLorean cars – and trinkets – might become hot again. 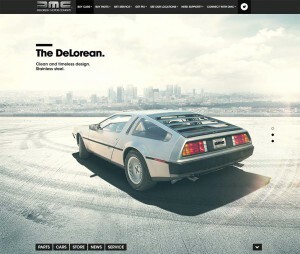 A screen grab of the DeLorean website. 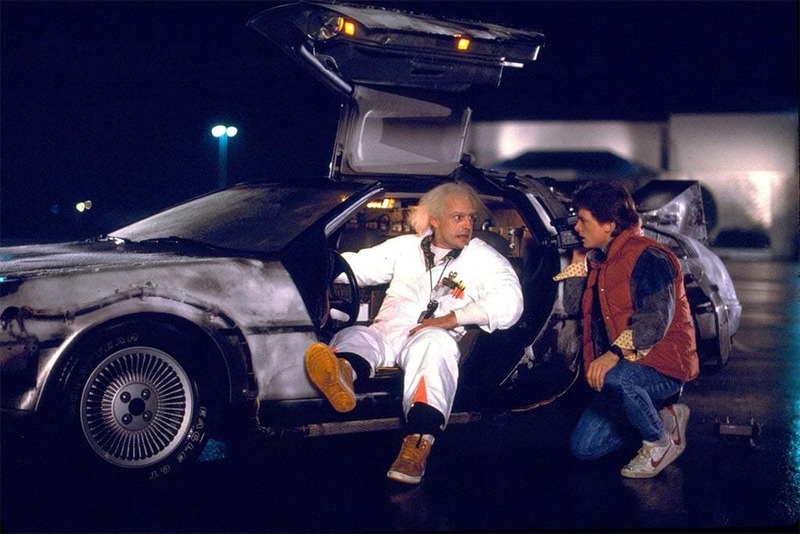 But a few years ago, an outfit in Texas began restoring old DeLorean DMC-12s. It even considered outfitting some with new electric drivetrains. Calling itself the DeLorean Motor Co., it also began offering hats, pens and other branded goods, and has been licensing the DeLorean name, as well as images of John DeLorean. Clients have included Mattel, Target, Nike, Urban Outfitters and Apple. The company was not affiliated with the original DeLorean Motor Co., and that led Sally DeLorean and her daughter to file suit last year. A tentative deal was derailed over the summer, but the two sides have now agreed to a settlement that will give DeLorean’s heirs a payout and rights to the late automaker’s name and likeness. The Texas company, meanwhile, will be allowed to continued marketing goods and services with the DeLorean Motor Co. name, logo and trademark. “This allows us to get back to the business of doing business,” said James Espey, the company’s attorney. 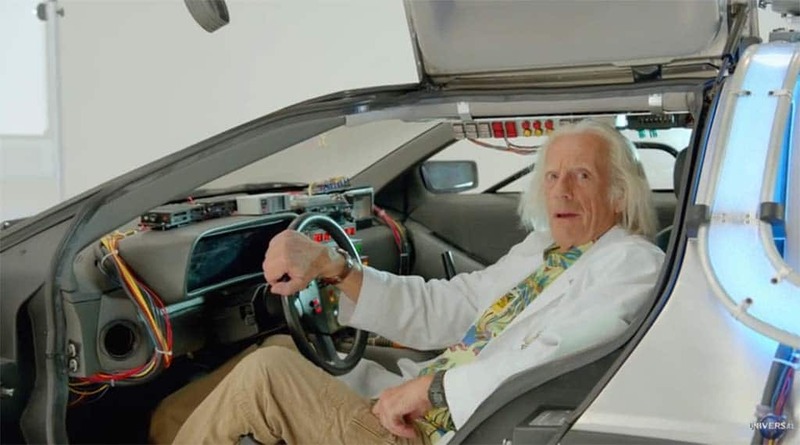 "Doc Brown" returns in new short, inspirational video to mark "Back to the Future Day." Toyota, for one, teamed up with lead actors Lloyd and Fox to produce a short film about the hydrogen-powered Toyota Mirai. You can check it out by Clicking Here. This entry was posted on Wednesday, October 21st, 2015 at and is filed under Automobiles. You can follow any responses to this entry through the RSS 2.0 feed. Both comments and pings are currently closed.